Last Friday was apparently fake hair day in Brooklyn. While riding my bike down Myrtle from Bushwick to Park Slope, I saw an orthodox jewish boy wearing a gigantic grey beard and two very white guys in an SUV wearing rosta hats, complete with fake dreads. 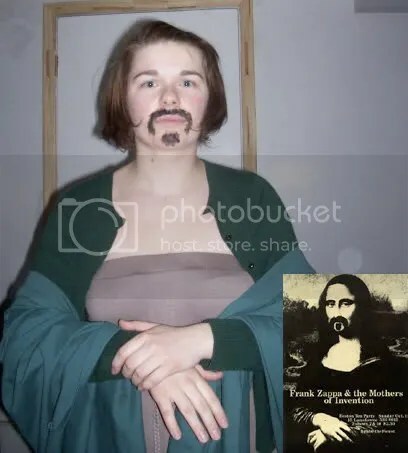 I waited until the next night to rock fake hair when I dressed up like Frank Zappa for my friend’s “Come as a dead musician party.” Sadly, I couldn’t find anyplace open that sold fake mustaches after 8pm on a Saturday night. Due to waiting till the last minute, I had to go with facial hair plan B: Wet and Wild eyeliner. I think I used a slightly too obscure reference, but it’s very rare I get the chance to dress up as a rock star and artwork with a beard simultaneously.